I am trying to establish if there is sufficient interest to add further coach sides to the Buffet & Corridor Second released last year. Originally built 1953 classified as 3rds built to run as railcar trailers 1356-1371 were the first of CIEs family of 64 seat standard open coaches. These coaches were also very close in outline to 1497-1503 some of the last traditional coaches built at Inchacore in the early 1960s. Originally classified as 3rds and introduced in 1953 some of these coaches were converted to driving trailers for use with the AEC railcars on the Westland Row-Galway & Westport "Cu na Mara" express service. 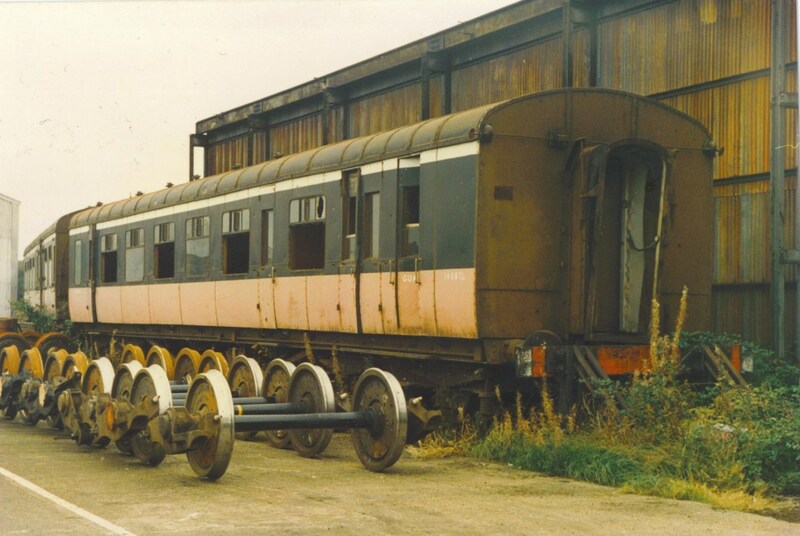 These coaches seem to have originally been introduced with guards look outs, some of which were later plated over, separate frets would be required for coaches with or without lookouts. This fret will be a tad more expensive than the ordinary coaches and a bit more involved to build as the van doors will have be engraved on a separate section of the fret to the sides. I am looking at expressions of interest for a minimum run of 6 of any one type. Another JM Model, yes please, I'll take one. Would be interested in full coach kit of these coaches similar to T.P.O./ Tool Van. I would most definitely be interested in both the SO and BGSV. What is the likely price, please? hello . Could you explain these overlays if you have time? What is involved in them ? What way do you use them and on what coaches ? Kieran did a thread on his Workbench on building a rake of "Bredins" with these sides http://irishrailwaymodeller.com/showthread.php/78-Kirley-s-Projects/page64. SSM or Comet may be able to supply suitable castings which would reduce tooling costs and speed up introduction. i will commit to two standard plus one brake std please. Did they all wear black and tan at some point ? Anyone know if these coaches ever made their way North? And same as Richrua, were they all Black and Tan or some green? Indeed they did, Nelson, on the "Enterprise". I have a colour slide somewhere of the CIE set about 1963, consisting of a brand newv 141 - straight out of the box and not even weathered yet - hauling a train of mixed laminates and ex-GNR stock, mostly still green but one or two in black'n'tan. There would have been a few green coaches still about until maybe 1965 / 6. Obviously, like any livery change, it was gradual, though CIE tended to look after coaches very well and therefore they were all repainted every 2-3 years. Count me in for 1 x standard and 1 x brake standard. superb work john. I have a client who wants to emulate the early eighties in Connolly and I think this is the way to go. Will pm you if its a runner, which it should be. :-) R..
Edit - it'll be a mixed rake with park royals and wooden bodied stock, so I reckon 4 would be the potential order. I would love to have the GSV please. There seems to be enough interest to go ahead with sides for the 3 types of coach. 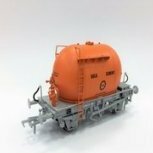 The BGSV has fired up a lot of interest, has anyone a photo or sketch of the generator/boiler roof hatches and exhaust detail? What is the general feeling around a complete coach kit on a similar principal to my Tin Vans or the SSM Bredins Vs plastic surgery and overlays to the Dapol body shells? The coaches could be designed to run on Bachmann or Hornby rtr LMS bogies similar to the GSR type with brass fold up bogies as an option for 21mm gauge. I'll go for the Dapol option please for both. Yes, I'd be keen to try the etched sides as well. Mayner and others touched on train makeup with stock like this. One day about 1983 I observed the comings and goings all evening in Dundalk. Most trains were 5-6 bogies plus van, either one of the several variations of 3223-style brake gennies, a Dutch van or a BR van. In no train were more than two coaches the same, and in several no two were alike. Cravens, park royals and laminates of several designs were all present. A few years earlier, there would have been the odd Bredin too. Nowadays, if a strange vehicle was anywhere near one of today's depressingly same uniform identikit trams, there would be proving runs, Europe-wide paperwork, "certification", tests, studies and enquiries. Consultants would be engaged, at eye-watering cost to the taxpayer, while safety cases were tendered, researched, drawn up, verified, and - most bizarrely of all - "signed off on". Who dreams up this inane drivel? Why do we, after nine million years evolution, reduce ourselves to accepting this rubbish! Rant over. To modellers: mix and match pre 1990 - always. In wooden stock days, you'd struggle to get two coaches exactly the same on any rural route at all, let alone the same train; with freight stock, same. I may be in a minority here but I would prefer the "scale" option i.e. full length/depth sides plus ends. My reasoning may be of interest to you and others. I have spent most of my life repainting British rolling stock plus cut-and-shuts of varying degrees of complexity; some even are quite close approximations of actual Irish stock! However, in more recent years, I've built a number of Worsley Works coaches and I'm currently working on some Irish Freight Models Park Royal kits. The contrast between the "high, wide and handsome" look of Irish coaches, built to correct scale and the rather undersize British conversions is now bothering me (although, whisper it, I'm still working to 16.5mm!). Therefore, while the Dapol option is most certainly convenient, I would prefer to do battle with a proper sized model, a la Worsley Works. Scale length, width coach kit option please. Yeah I would like something like Worsley Works kits as in scale length and width sides with ends type kit please. If scale length/width is an option then count me in. John I would would prefer the scale length versions. These coaches look so unique with the extra width that it would be a shame not to have the option. I would be happy with the etch sides and i will make the floor and ends myself with brass plate already bought so i can solder the sides on. Any decision as to which option you are going to go with for these coaches? There seems to enough interest to go ahead with both the overlays for the Dapol coaches and a scale length/width coach. I am planning to release side overlays for the Second Open, Brake Second Open and BGSV in September/October. The coach likely to be sometime in 2016 once I have released the MGWR 2-4-0 & CIE 4w container wagons. When will the Midland 2.4.0 be available? Thanks John,look forward to the release of the side overlays for the second open and brake second open. The drawings for the Standard Open, Brake Standard Open and Brake Standard Generating Steam Van are ready for the engravers should have the etches for the SO & BSO should be available from August. The BSGSV may take a little longer as the overlays are a bit more involved and may require revision before I release the fret.